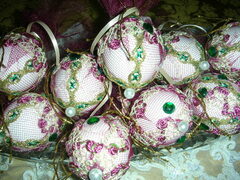 Faery eggs or Cascarones are eggs which have been blown out, dyed, decorated, then filled with offerings to the Fey. They are then hung outside in trees or bushes. You will know that faeries are present in your yard when you discover that the egg has broken open and the offerings inside released. Blow out your eggs by making a small hole on each end, then with the narrow end down gently blow the contents into a bowl. Enlarge the hole at the wider end to about 1/4", this is where you'll fill the egg with offerings. Wash out the empty shells with cold water and let dry. If you have white eggs you may dye your shells if you wish, but dying is optional. Once your Cascarones are completely dry, decorate them and fill them with your offerings. Cut ribbon approximately 18", fold it over to form a loop then glue the free ends so that they cover the 1/4" hole. You may then hang your Cascarones outside. Come to my garden Faerie Child. Come to my garden to live and play.